What separates a good sushi chef from a great one? What Makes a Great Sushi Chef? 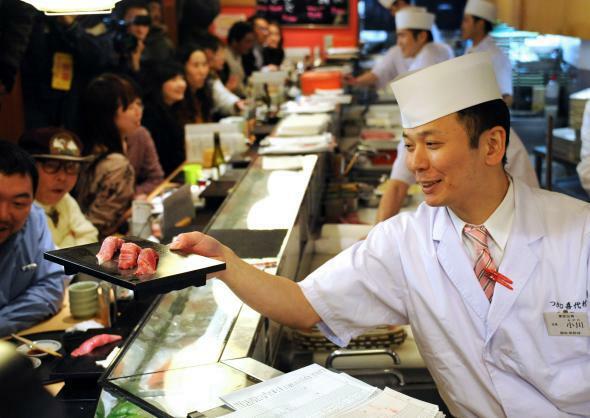 A sushi chef serves up tuna sushi at the main restaurant of the popular Japanese chain Sushi-Zanmai near Tokyo’s Tsukiji fish market in 2013. To learn the techniques of sushi is given. I believe the following traits show the fundamental character of a person and his discipline as a chef. Most of the traits may seem small and tedious. The fact is that sushi preparation is made up of hundreds of small and (what may seem) tedious daily routines. One can easily skip those routines if one wants to. What makes the difference at the end of the day is one’s willpower to hold on to his discipline to do all those small steps. Ultimately, it is an accumulation of those daily routines that will make a good sushi chef into a great one. Additionally, many motivated and eager younger chefs have a tendency to focus mainly on the sushi techniques and ingredients (i.e., fish flown from Tokyo Tsukiji Market, expensive knives and tools). They are just exterior coating that make up a sushi chef, representing only the half of his story. The other half lies inside of him. The most skilled sushi chef I’ve ever worked with once told me this: I can tell how good of a sushi chef he is by looking at his knife. After 15 years of professional sushi career, I now know what he meant back then. When I was working at a sushi bar, I sharpened my knife every day, sometimes twice if the restaurant was busy. A chef’s knife is a good indication of how he takes care of this tool. It will tell how much attention he is paying to his knife, consequently, how much attention he is paying to the sushi he makes. His knife will also reveal his knife sharpening skill. Just because he is using an expensive knife doesn’t automatically mean he is a good sushi chef. In fact, quite contrary, the most talented sushi I’ve ever worked with used very inexpensive knives. Most of the time, I use an ordinary 9-inch chef’s knife I purchased in Chinatown. What should you look for in a great chef’s knife? It should look well-sharpened, no tipped edge, and well-cleaned. I look at its shape to see if it has a nice silhouette. That being said, I am not exactly looking for his knife-sharpening technique. What I am looking for is his attitude and philosophy of what sushi chef should be. You see that it’s easy to skip the daily knife sharpening and start slicing the fish, especially when you get busy. It’s not like your customer will notice it if you skip one of our daily routines. You can tell yourself, “Hey, no one will notice it.” Yes, no one will notice it, except you. I do have to admit I have skipped my daily sharpening routine many times. No one, except yourself, will and can tell you to do that routine. That’s discipline and takes strong willpower. Naturally, if one has that kind of discipline, it will make him a great sushi chef. The same thing can be said about his tools. The way he takes care of his tools, and the way he organizes them, will tell you what kind of sushi chef he is. An exceptional chef is exceptionally clean, both physically and mentally, whether he is on a job or off. Physical cleanness comes from his appearance—combed hair; clean, pressed shirt: short nails: and a clean, shaved face. Especially for a sushi chef, clean, short-cut nails are important. If I wanted to know how great of a sushi chef he is, I would look at his hands, particularly his nails. I take care of my hands regularly to make sure my nails are short and no scars are visible. The reason I keep my hands clear is for my guests. It’s never meant to tell or show off others how beautiful my hands are. Jiro Ono, the world-famous sushi chef, wears gloves 365 days a year, even in summer, to avoid sunburn on his hands—all for his customers. I believe in the saying: How you do one thing is how you do everything. If the chef handles ingredients poorly, it means he handles everything else poorly as well. If you see the chef dropping ingredients on the cutting board, throwing them around, or just handling them roughly, then it would give me a reason to believe he may not be a great chef. When you drop an apple, it will develop a bruise, and it will change the taste of the apple. That is poor handling. Fish is so delicate, and when you handle a fish poorly, you will damage it and alter the taste. A great chef knows this and pays extreme attention in handling his ingredients.